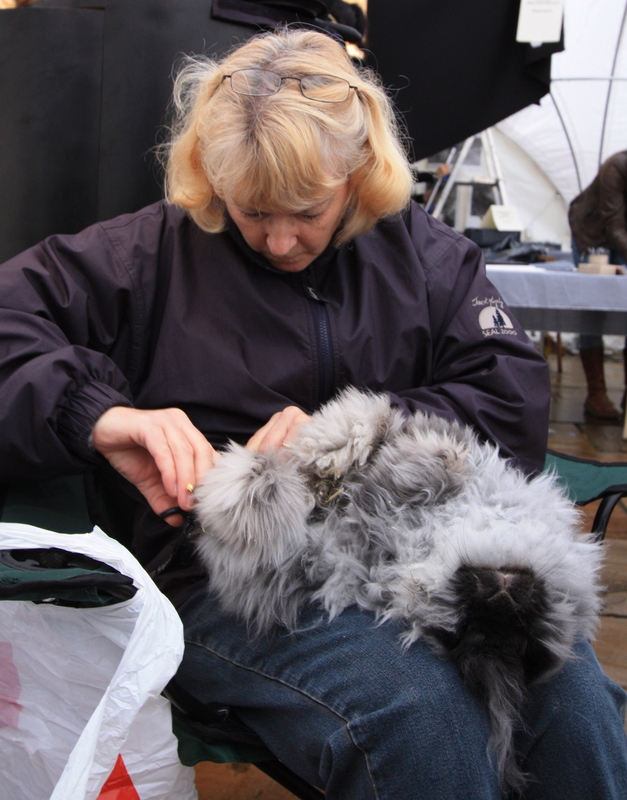 Babies intended for exhibition will require daily grooming from about 6 weeks old onwards. Rabbits for exhibition should have a British Rabbit Council (BRC) ring size E slipped on to a hind leg at between 6-8 weeks depending on growth rate. NB: This is most important as non ringed rabbits cannot be shown. 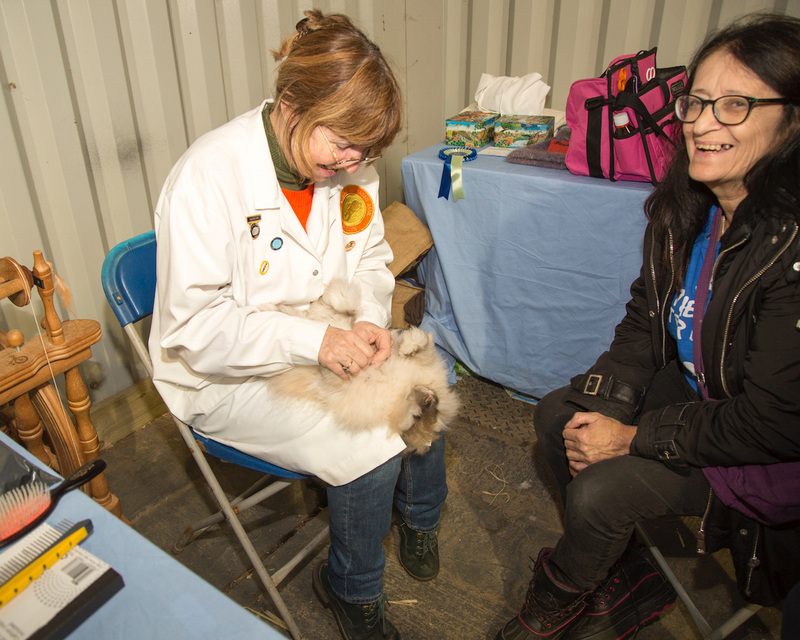 Get your breeder to show you how to groom and clip when buying your rabbit. 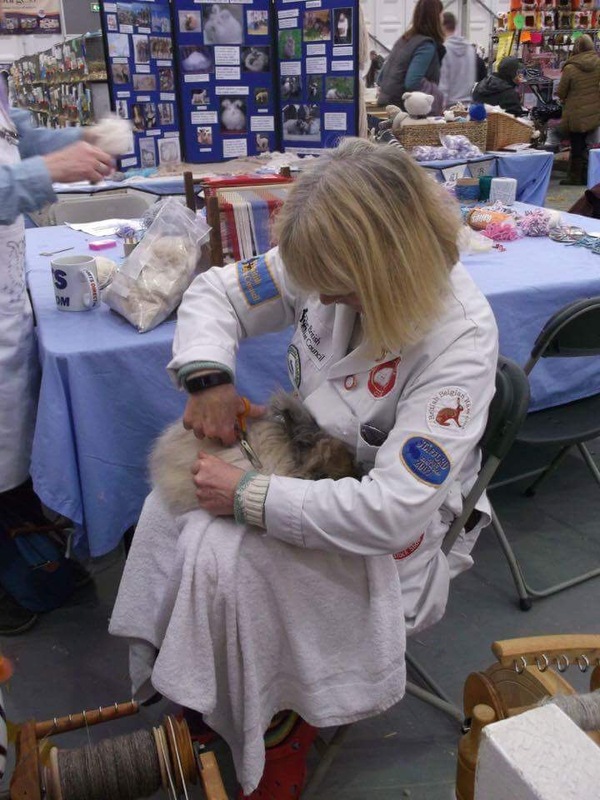 Join the National Angora Club for help and advice. Members at shows are usually happy to explain and/or demonstrate show grooming. 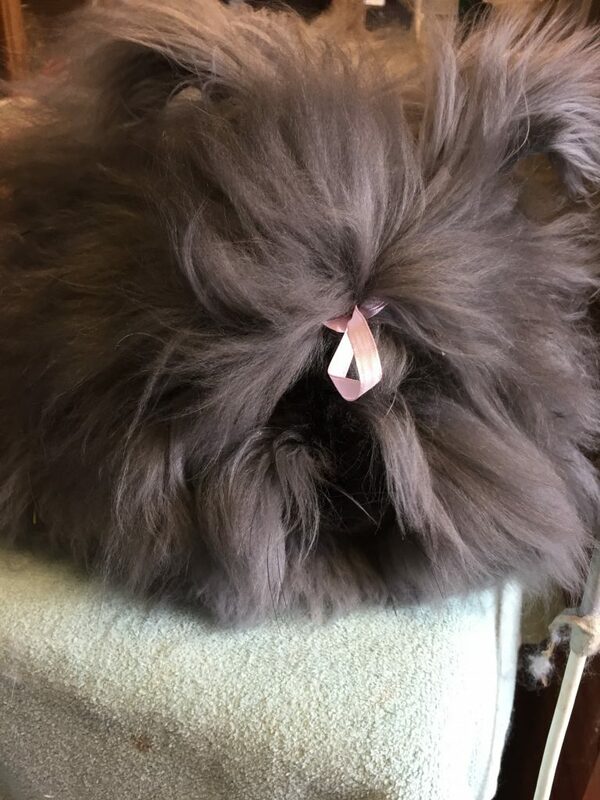 A brush should be used sparingly on a show-coated Angora. Instead blow the coat apart by using the blowing attachment of a vacuum cleaner or a powerful hairdresser’s hair dryer. Ordinary hairdryers usually lack the power to produce a forceful jet of air necessary to part the hair and minor tangles. At first allow a few minutes daily for grooming but increasing time will be needed as the coat lengthens, and all along the emphasis is on blowing not brushing. Any slight knots that form in the coat must be teased apart gently with the fingers and then blown. The rabbit’s underneath and feet can be groomed by turning the rabbit on its back. Hold the rabbit firmly by the ears with the other hand supporting the hind quarters with its tummy to your chest. Turn the rabbit upside down onto your lap so that the hind legs are against your stomach, its back and head on your knees, and the ears held firmly between your knees. After a while the rabbit will learn to lie quietly while you groom it underneath. Occasionally at first the rabbit may struggle a bit, so be careful not to damage it or its coat. Be gentle but firm. If baby Angoras are to be kept for woolling, the babies can be kept together until the first clipping which is carried out at about 10-12 weeks, when the bucks are separated, but the does may remain together for a few weeks longer before being placed in individual hutches. The Angora coat grows about 1” per month approximately, and one rabbit may yield around 10 oz of 1st grade wool annually. 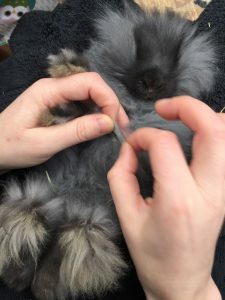 For wool grooming the rabbit is groomed once or twice a week depending on length of coat. A brush can be used. A plastic “Hedgehog” type brush wih rounded tips works well. The rabbit is brushed sitting on the knee, the cheekpieces checked and then the rabbit turned on to its back to check underneath for matting. The area around the vent should be kept clipped short for hygiene and checked regularly for cleanliness, particularly in the hot summer months. The area around the back of the neck needs to be checked regularly for debris and mats, as the rabbit finds it difficult to reach this area. Other problem areas are cheekpieces, and around the junction of the legs and the body, as mats of felted wool can occur around the armpits. If this happens, the mats can be clipped away, being careful to see where the scissor blades are at all times. 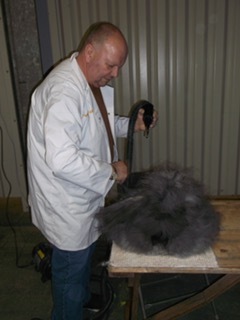 Clipping the rabbit 3 monthly makes the task of grooming much easier than in the exhibition rabbit. Posted 27/03/2018 by SM & filed under General interest.